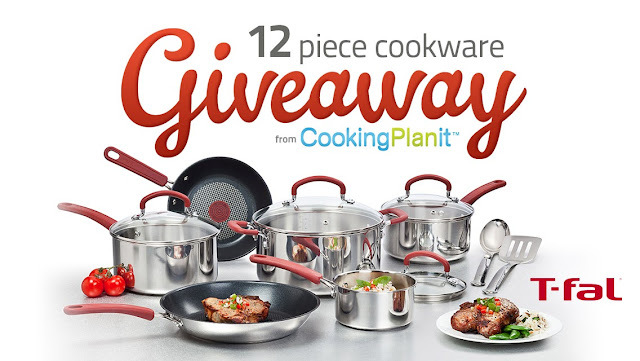 Click the banner for 50 chances to win this T-Fal cookware from Cooking Planit! My friend Dory is one talented lady! She is the soloist at her church, works with the local elementary school choir on a total volunteer basis, often lends a helping hand to those in need, and super organizes a household of three busy kids and a husband. However - Cooking is not something she enjoys and usually consists of opening a jar of pasta sauce. When I told her about Cooking Planit she was intrigued because she is into anything that makes the chaotic dinner hour easier, but she got a big laugh out of the idea of me taking pictures while she cooked a meal. 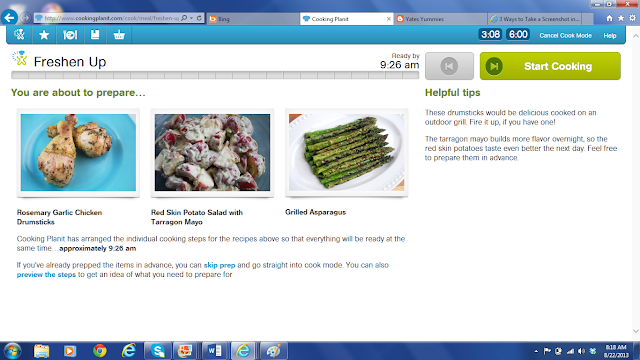 First, she signed up for the free Cooking Planit app at https://www.cookingplanit.com . Then she started browsing around. She was impressed by the yummy looking pictures and how she could Search for a meal or recipe that fits the preferences of her family; for example, no beans. She loved the fact that she was not overwhelmed by an unwieldy amount of choices and could easily center in and pick one she thought her family would enjoy. 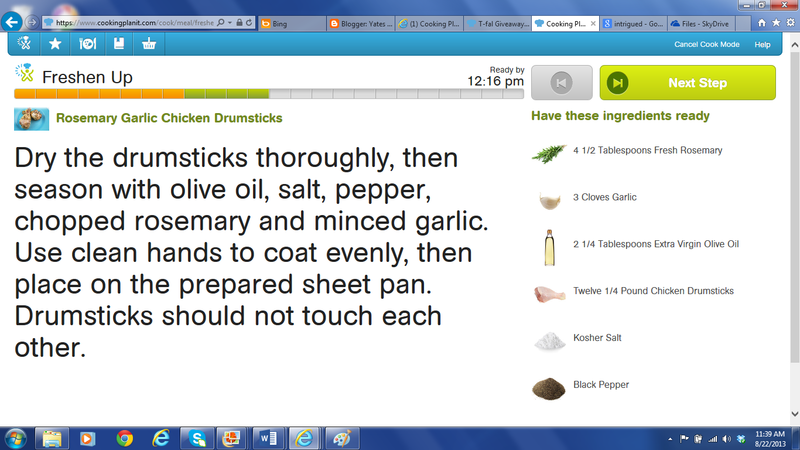 She settled on the meal "Freshen Up" because her kids like chicken and the drumsticks looked fun. The fact that Cooking Planit generates a grocery list with the ingredients needed made a big impact on Dory. She could have printed it out, but instead grabbed her phone and synched the app on it so she would have it at the grocery. One great thing about the grocery list is that you can delete items from it that you already have on hand. She went over to her pantry and clicked off what she already had. Dory's daughter Bridget went with her to the store. When it came time to pick out the herb for the potato salad a little bit of negotiating went on. Bridget and the rest of the family love basil, so Dory opted for it instead of the tarragon. 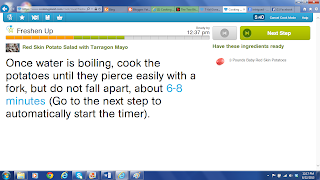 She knew she needed the same amount and appreciated the flexibility Cooking Planit recipes give to accommodate family tastes. Once home, Dory wanted to time the meal to be ready at 6pm because she had to be at church at 7. Cooking Planit told her she needed 1 hour and 8 minutes, so she started in just before 5:00. Dory is all about organization and she loved that the ingredients, equipment, and steps were all listed before she even began. 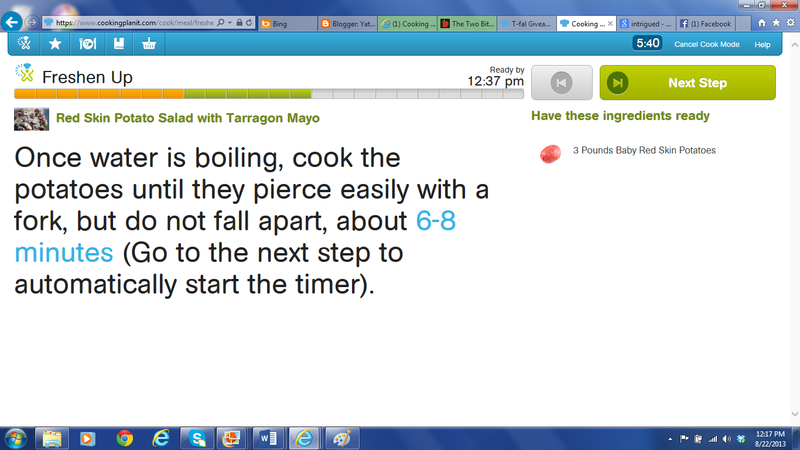 Before clicking on "Start Cooking", Dory had the option of previewing the steps or skipping the prep. 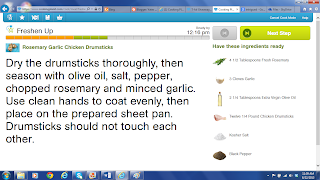 The "Helpful Hints" section suggested that the drumsticks could be grilled as well as being baked so Dory opted to get her husband, Gabe, involved in doing that. Notice the little timeline under the title "Freshen Up"? Well it adjusts to the speed of your clicks and even if you have to stop for a minute (Dory had to track down her son Isaac and remind him he had soccer practice at 8), all the dishes in your meal will still come out at the same time. Impressive! During the process, if there is downtime a little message will suggest that now would be a good time to clean up a bit or sip on a beverage! Gabe was out grilling by the time the red skin potatoes were cooling and Dory was clicking along and whisking up the dressing. Check out the great looking T-Fal pan! 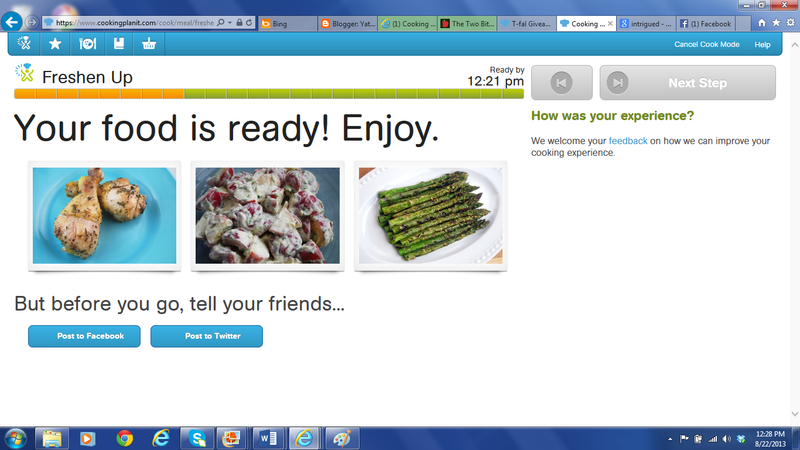 Dory completed the last few steps and all three dishes were ready at the same time! The family loved the food! Gabe said, "This is light but tastes gourmet!" and Dory agreed that everything was delicious. 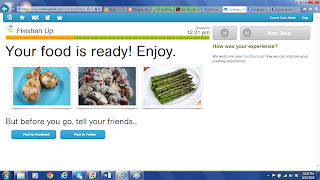 The meal she made is saved on her Cooking Planit home page, but Dory is excited to try other Cooking Planit meals to make dinner time have more variety and be less stressful.